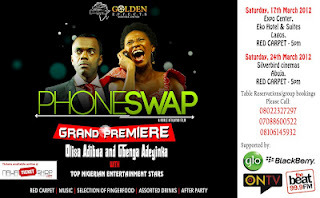 Kunle Afolayan’s earlier self-directed projects are the critically-acclaimed ‘Irapada’ and ‘Figurine‘ is set to premiere his new movie ‘Phone Swap‘ on Saturday, March 17, 2012 at the Expo hall Eko Hotels and Suites. The movie is a story of two individuals from two different backgrounds who began a new phase in their lives after having their phones swapped. The film which parades award winning stars like Joke Silva, Chika Okpala, NSE Ikpe-Etim, Wale Ojo among others, is expected to hit the big screen to over 2000 audience from the Business and Entertainment world. Like other Afolayan projects. around the world before an eventually release on DVD. It will be released off the stables of Golden Effects Pictures. It is the first time a movie premiere will hold at the luxurious Expo hall of Eko Hotel and Suites – and it’s no surprise Kunle Afolayan is raising the bar again with this movie. This project is supported by Globacom (the telecoms company which has Kunle Afolayan as one of its brand ambassadors) Beat FM, ONTV and Blackberry.